The Centers for Disease Control and Prevention (CDC) has tracked the approximate number of children diagnosed with autism spectrum disorder (ASD) since 2007. Over the years, the estimate has grown from about 1 in 150 to about 1 in 68. Whatever the cause of the surge—the CDC cites improved and earlier diagnosis, a more inclusive definition of ASD, an actual rise in the occurrence of ASD, or all of these combined—many more parents and extended family members are caring for children with a wide range of special needs. 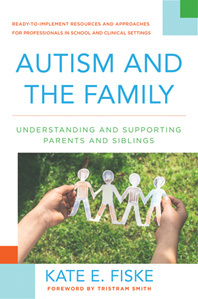 In Autism and the Family: Understanding and Supporting Parents and Siblings (Norton, 2017), Kate E. Fiske examines the essential role families play in the lives of children and adults diagnosed with ASD, as well as the everyday effects of that responsibility. Fiske, a clinical faculty member at Rutgers University’s Douglass Developmental Disabilities Center, makes a strong case for including family members when teachers, doctors, therapists, and other professionals provide services to individuals with ASD. Essentially, when professionals take the time to listen to and empathize with parents and siblings, practitioners and families can then work together to provide more effective services for all involved. Throughout, Fiske interweaves powerful personal stories gathered from interviews with parents and siblings, a clear research base, and her experience as a practitioner as she discusses the various ways parents might react to a diagnosis of ASD, potential sources of stress for parents, support required by siblings, acknowledgement and acceptance of cultural differences, and the intrinsic value of building a positive rapport. Each chapter ends with a succinct overview of important points which provide built-in openers for discussion and reflection. A lengthy list of resources is appended. Although ASD crosses all races and ethnicities, children of color are often diagnosed later. A PBS NewsHour Report from February 7, 2017, Children of Color with Autism Face Disparities of Care and Isolation addresses this discrepancy with a perceptive video interview of a family outside of Chicago that talks about their search for services. The Philadelphia Autism Project disseminates information on autism to residents of Pennsylvania, but the project’s videos highlighting the experiences of African American, Asian, and Latino families are available online to all. The Parent’s Corner of the South Asian Autism Awareness Centre, based in Toronto, Canada, offers advice and information with accompanying videos that feature South Asian children, as well as parents and instructors. Founded in 2001, the Organization for Autism (OAR) uses “applied science to answer questions that parents, families, individuals with autism, teachers and caregivers confront daily.” In the section for families, free materials—including Life as an Autism Sibling: A Guide for Teens, a handbook for teens and pre-teens, and Autism, My Sibling, and Me, an interactive workbook for younger children—can be downloaded or ordered by mail. In addition, OAR offers an online toolkit, Operation Autism: A Resource Guide for Military Families, which addresses challenges specific to the military, such as family separation and healthcare access. For a list of additional titles on the subject, see Alicia Eames's "The Autism Spectrum: Books for Kids, Parents, and Teachers."